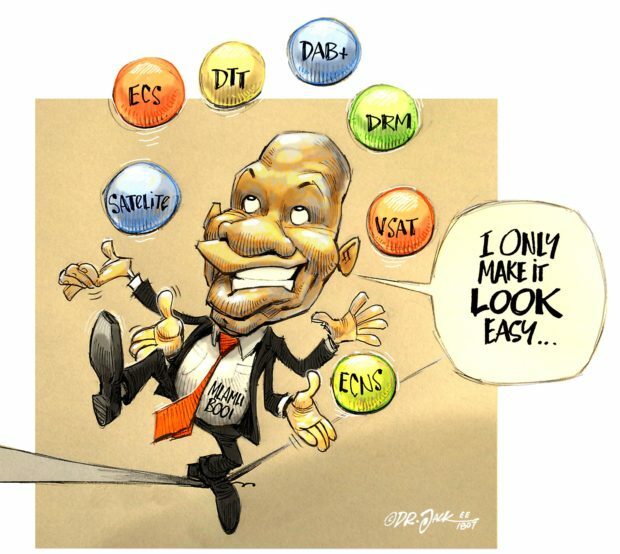 The process of resolving land claims in South Africa is often a contentious and time-consuming one. Furthermore, a land claim is a spatial problem in that claimants lay claim to particular farms or properties. GIS provides tools that are able to assist the process of resolving these claims. This article examines the use of GIS technologies to provide evidence from historical aerial photographs both for and against a claim. and to provide for matters connected therewith . Fig. 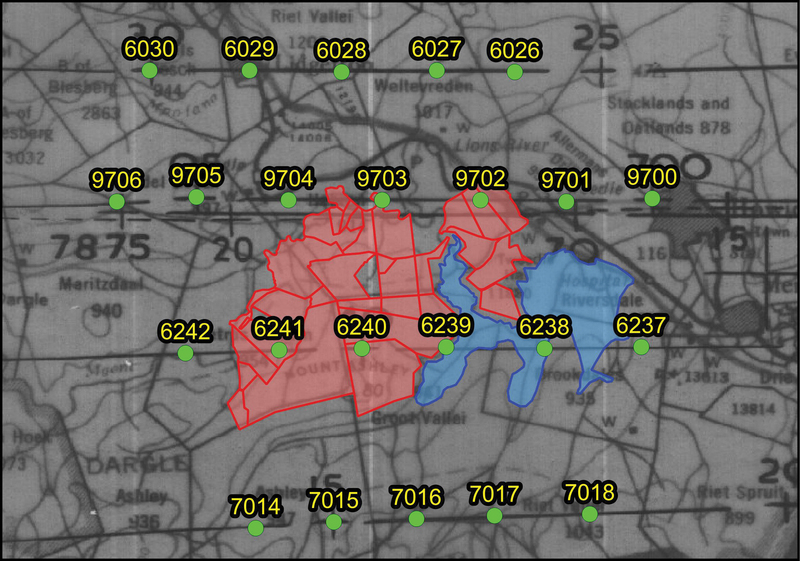 1: Portion of the flight plan for Job 573 with claimed farms shown in red, Midmar Dam in blue, photograph locations in green and photograph numbers in yellow. In providing for the establishment of a Land Claims Court, the act establishes a legal framework for the processing of land claims. A key part of the legal process is the gathering of evidence, both for and against a claim, which can be presented in court and help determine the outcome of a claim. Common forms of evidence are archived official documents, oral evidence, photographs and physical evidence such as graves, old fields, ruined homesteads and other archaeological remains. Physical evidence in rural areas is often difficult to obtain as in many cases it may have been erased by subsequent farming activities, such as ploughing. Another key line of evidence, oral evidence, becomes harder to gather the further back in time the removals took place. In these cases, photographs play a valuable role in establishing the merits of a claim, especially if the photographs can be accurately located in time and space. It is in the processing of historical aerial photographs that GIS technology plays a key role in the land claims process. Fig. 2: Scanned photograph before (left) and after cropping (right). Photographs were cropped so as to maximise overlap between adjacent strips. South Africa’s national mapping organisation, NGI (National Geo-spatial Information), maintains an extensive archive of aerial photographs dating from the mid-1920s to the present day . The regular aerial surveys conducted in the decades leading up to the 1990s constitute an invaluable record of settlement patterns in South Africa and, in the case of land claims, can provide evidence both for and against a claim. Interpretation of aerial photographs taken just before removals took place allows a picture of land use and settlements patterns to be built. 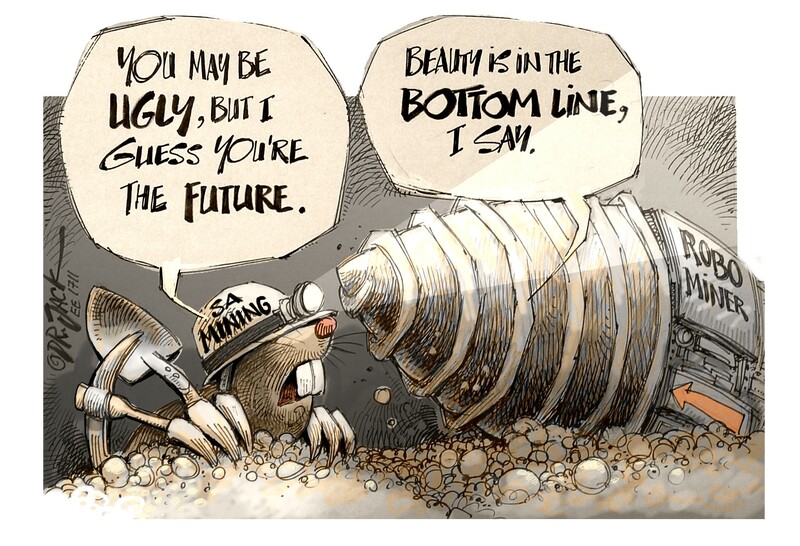 This is particularly so for rural settlements with their distinctive patterns of homesteads and subsistence fields. However, researchers gathering evidence for a land claim often lack the skills required to source, process and interpret aerial photographs. Our company, EduAction – GIS Solutions, has for a number of years been involved in providing GIS services to map the layout and infrastructure of rural communities being relocated due to mining activities. It was against this background that we were approached in 2011 to assist in the gathering of evidence from historical aerial photographs for use in land claims. The first such case we worked on was the Emhlangeni land claim in the Lions River area near Howick in KwaZulu-Natal. Researchers involved in the case had managed to obtain prints of aerial photographs taken during the 1959 aerial survey but needed assistance in interpreting these and linking them to actual farms that had been claimed. Fig. 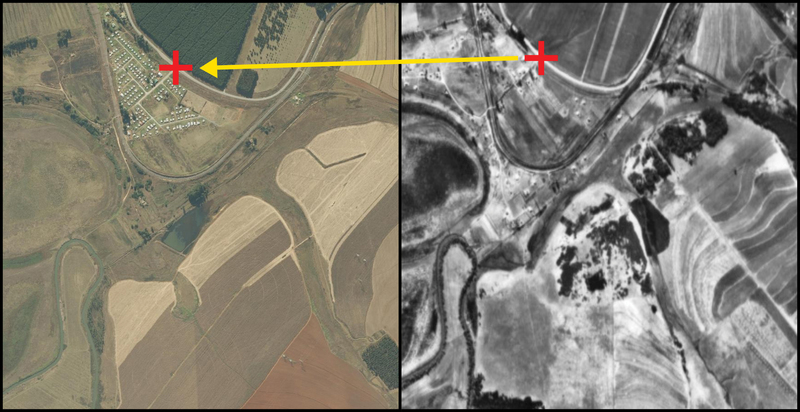 3: Identification of a ground control point on the 2009 georeferenced photograph (left) and the 1959 aerial photograph (right). In January 1996 a claim was lodged by Elias Ndlovu on behalf of the Emhlangeni community and a notice to this effect appeared in the Government Gazette issued on 16 July 2004 . The claim was lodged against 34 farms in the Lions River magisterial district, details of which were attached to the notice. These details included property descriptions, current title deed numbers, current owners as well as a list of bonds and restrictive conditions. Many of the claimants had been living on these farms and in areas now inundated by the Midmar Dam. Construction of the dam took place from 1961 to 1965 so aerial photographs from before and after these dates would prove useful. Much of the NGI aerial photograph archive is available in digital form as high resolution scans. These scans of photographic prints are each numbered according to job, strip and photograph number. Flight plans for each job have also been scanned. In many cases orthophotographs are not available so the flight plans were used to determine which aerial photographs to use for a particular land claim. Photographs were georeferenced using ground control points (GCPs) obtained from current orthorectified imagery. Georeferencing in this manner was deemed accurate enough and a full othorectification was not performed on the photographs. ArcGIS was initially used for georeferencing but we soon moved over to QGIS as its dual window geoprocessing tool makes it much easier to georeference a target raster against a source raster image. Mosaics were created from the georeferenced photographs followed by identification and enumeration of homesteads and fields. The results of the interpretation were presented in both map and tabular form. Details of these steps appear below. Fig. 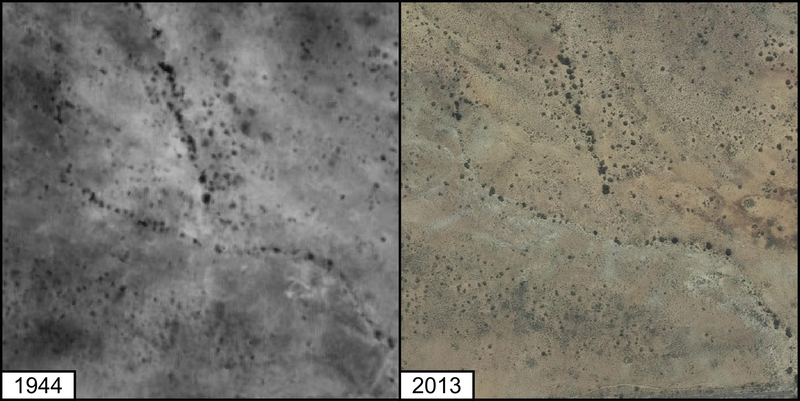 4: Bushes and trees visible on an aerial photograph taken in 1944 (left) and in 2013 (right). Descriptions of claimed farms were extracted from the Government Gazette and matched to 21-digit cadastral land parcel keys where possible. For example, the farm described as Remainder of Portion 64 of the farm Hebron No. 914 was linked to the key N0FT00000000091400064. The land parcel keys and farm descriptions where then used to extract the boundaries for each farm. The farm boundaries were sent to NGI in Cape Town and a request was made for aerial photographs from the 1950s and 1960s. The consultants at NGI confirmed that a survey had been flown in 1959 (Job 433) and another in 1967 (Job 573). No orthophotos were available but we were given prints of the 1959 photos and digital scans of the 1967 photos. We were also sent scanned copies of the flight plans for both jobs. The flight plans were georeferenced and the farm boundaries were overlaid on the flight plans to determine which photographs covered the farms that had been claimed (Fig. 1). A list of photographs was compiled for the next step in the process. 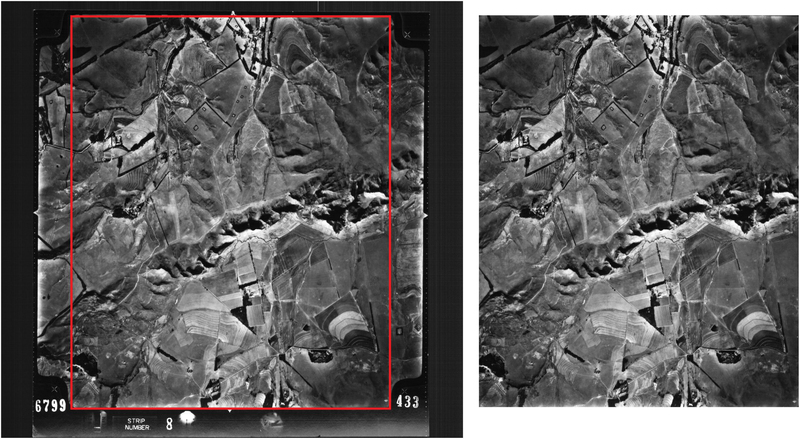 The photographs from the 1959 survey were scanned at high resolution while the 1967 photographs were already in digital format. All scanned images were cropped to remove the borders and fiducial marks at the corners of the photos. Adjacent aerial photographs usually have a large amount of overlap in the direction in which the strip is being flown and less overlap between adjacent strips so the photographs were cropped so as to maximise the amount of overlap between strips. The strips flown during aerial surveys 433 and 573 were flown in an alternating east-west and west-east pattern so the cropped areas were maximised at the top and bottom (north and south) of the photographs. This can be seen in Fig. 2 where the red rectangle indicates the boundaries of the area to be cropped. The QGIS Georeferencer was used to georeference the historical aerial photographs (the source images) against 2009 colour othorectified imagery (the target images) supplied by NGI. GCPs were identified on both the source and target images (Fig. 3). The QGIS Georeferencer window floats above the main QGIS application so it is easy to arrange the windows so that both the source and target images are visible at the same time. Entering GCPs is then a simple process of clicking the points on the source image and clicking the equivalent points on the target image. It is also possible to link the two windows so that zooming and panning operations are linked. A minimum of 15 to 20 GCPs were identified for each aerial photograph. In many cases, especially with older photographs taken in rural areas, it was not possible to easily identify GCPs still visible on modern photographs. However, it was found that features such as trees and termite mounds, or the remains thereof, were often visible over many decades and could also be used as GCPs. This is shown in Fig. 4 where the same trees and bushes are visible in photographs taken 69 years apart. The GCP table was carefully monitored during the process of digitising GCPs to ensure that features identified on the source and target images were in fact the same features (Table 1). Misidentified features would show up with large residual errors in the GCP table. Once enough GCPs had been identified on a photograph, a third order polynomial transformation was applied and the source image was saved as a GeoTIFF file. The process of using GCPs and a third order polynomial transformation doesn’t produce an orthorectified image but the georeferenced photographs were deemed accurate enough for the task at hand, namely the overlaying of farm boundaries and the identification of homesteads and fields. Fig. 5: Example of three mosaicked images. The next step in the process was to create mosaics of the georeferenced images. This was a two-step process involving (i) the blurring of image boundaries and (ii) the balancing of brightness and contrast between images. Image boundaries were blurred using the QGIS raster clipper tool with the cblend switch set to 40 so that image edges faded to transparent across a distance of 40 pixels. This method resulted in the overlapping images blending into one another across their boundaries and produced a more seamless looking mosaic. The images in the mosaic were also adjusted in order to balance the contrast and brightness between images (Fig. 5). The process of identifying homesteads and subsistence fields was perhaps the most crucial stage as this evidence would be presented at the land claims court. Homesteads in most rural areas of South Africa consist of clusters of round huts. These are often surrounded by subsistence fields which tend to be small and irregularly shaped. Commercial fields, by contrast, are usually larger, have more regular outlines and often show signs of contour ploughing. Fig. 6 shows an example of homesteads in rural KwaZulu-Natal surrounded by fields and footpaths. The boundaries of the farms under claim were overlaid on the photo mosaics and each farm was systematically examined for evidence of fields or homesteads. Fields and homesteads were captured as polygons with attributes indicating which farm they were on. Fields were classified as being subsistence, commercial or unknown. The size of each field was also calculated. Fig. 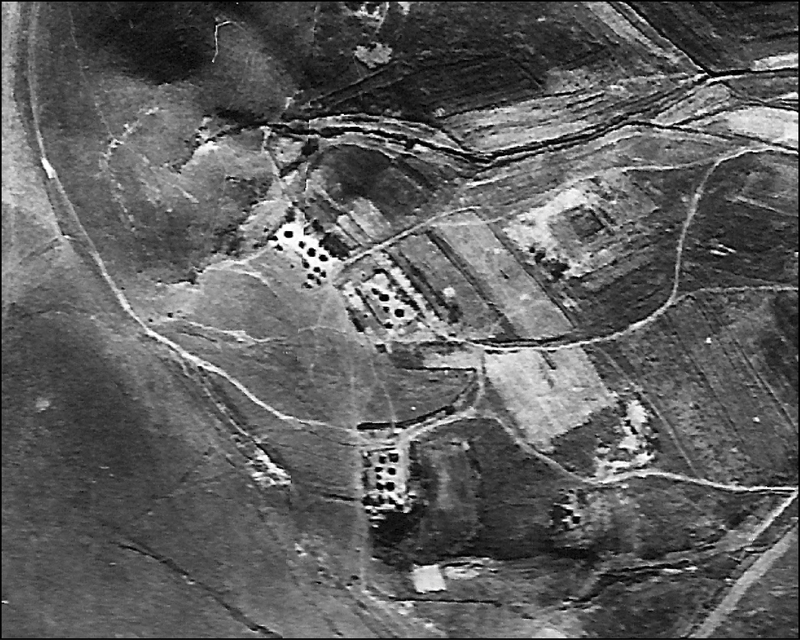 6: Homesteads and subsistence fields visible on a 1959 aerial photograph. The final step was to present the results of the mapping exercise. Results were presented both in the form of maps and tables. Overview maps showing farm boundaries overlaid on the georeferenced and mosaicked aerial photographs for 1959 and 1967 provided the context against which the claim could be evaluated. Smaller maps focussing on each farm were also produced using the QGIS atlas function. Standard features such as legends, scale bars and labels appeared on all the maps. The maps were supplied in PDF format and sized for printing on both A0 and A1 sheets. An analysis of homesteads and subsistence fields revealed that in 1959 there were 70 homesteads and 142 fields on the 34 farms under claim. By 1967 this had dropped to 57 homesteads and 133 fields. It was also noted that on the photographs there was no evidence of homesteads or subsistence fields on eight of the farms in 1959 and nine farms in 1967. These findings are summarised in Table 2. Table 2: Summary of homesteads and fields on the 34 farms under claim. The claim was settled in court in February 2012, 16 years after the claim was lodged and eight years after being gazetted. 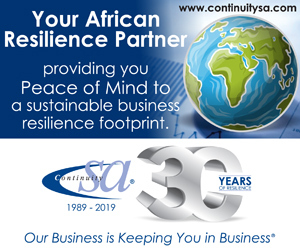 The ruling was in favour of the claimants who opted for financial compensation and were awarded a sum of just over R10-million. No land was returned to the claimants as the farms were deemed too expensive to buy . A notice withdrawing the claim against the 34 farms appeared in the Government Gazette of 15 June 2012 . GIS technology has proved a useful tool for assisting researchers gathering evidence for land claims. Claimants can use evidence from historical aerial photographs to support their claims while landowners can use these same photographs to defend against claims that might not be justified. In this article a detailed methodology was presented outlining the process of sourcing, preparing, processing and analysing aerial photographs. While QGIS was used to process the photographs described in this article, it is important to remember that it is the GIS techniques that are being emphasised and any GIS package that provides these tools could be used. This paper was presented at the FOSS4G Africa 2017 Conference in Johannesburg, South Africa and is republished here with permission. South African Government Gazette, Act No. 22, 1994: “Restitution of Land Rights Act”, Government Gazette No. 16106, pp. 3-31, 25 November 1994. NGI website, www.ngi.gov.za/index.php/what-we-do/aerial-photography-and-imagery, accessed 16 August 2017. South African Government Gazette, Notice 1417 of 2004: “General notice in terms of the Restitution of Land Rights Act, 1994 (Act No. 22 of 1994)”, Government Gazette No. 26552, pp. 173-176, 16 July 2004. IOL website, www.iol.co.za/news/politics/land-claims-settled-for-r25m-1237818, accessed 16 August 2017. 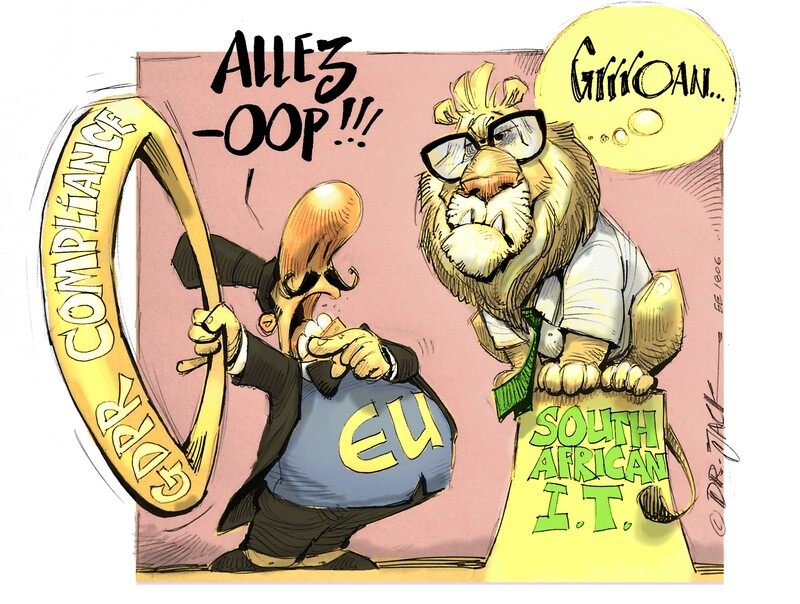 South African Government Gazette, Notice 497 of 2012: “Notice of withdrawal in terms of Section 11A(3) of the Restitution of Land Rights Act, 1994 (Act No. 22 of 1994)”, Government Gazette No. 35435, p. 63, 15 June 2012.